Protect property, equipment and workers! Crane Anti-Collision systems can be set up to slow down and stop overhead cranes when traveling towards another crane or structure. These devices not only used to protect the expensive material handling equipment in your plant, but it also protects your operators. If operators are traveling in cab operated cranes, this crane anti-collision sensor can audibly alarm them, causing them to slow down their crane and prevent potentially devastating accidents. 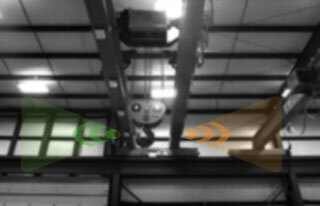 This system allows LED reflective sensing up to 33 feet for crane to crane separation and end stop anti-collision. These are some of our most popular kits, and come with the sensor unit, reflector array, mounting bracket, and 24 to 240 VAC. If you have energy efficient fluorescent lighting or metal halide you will need the CAS-1RA-O option for the LED to function correctly. The ReFlx 120 and Reflx 45 utilizes a solid state control board in a small easy to mount enclosure. 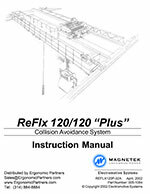 These systems can be used on single speed, stepped controlled, and VFD style cranes. 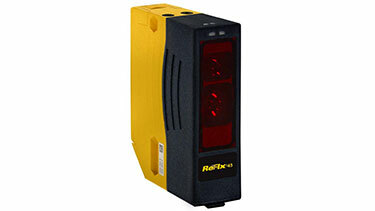 The ReFlx 120 system has a two channel infrared sensor adjustable from 2 to 120 feet. The two channel sensor can be set up multiple ways, but typically the first channel is used as the primary stop, while the second channel is used as the redundant stop. 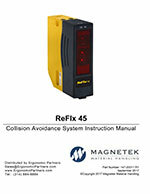 Magnetek's ReFlx 45 enhances the performance of overhead material handling systems by preventing crane-to-crane or crane-to-end-stop collisions. Typical 45 Kits include the following: Sensor, Sensor bracket, 2 X 2 ft. adhesive reflector standard for convenient placement. Features: Single stop action, All electronic components built into one housing, 3-45 foot detection range, IP67 rating for indoor applications, 24-240 VAC, 12-240 VDC. 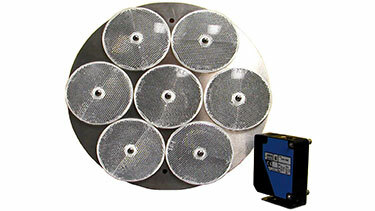 Typical 120 Kits include the following: Two-Channel Sensor, Controller, Diamond Reflective Target (2 foot x 2 foot). It is most commonly used in applications requiring only a stop command however the two-channels in the sensor allow a primary stop and an emergency redundant stop. Optical Laser continually monitors crane position so primary signaling is not affected by electrical noise. Range from 8 inches to 150 feet. 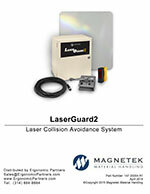 Can be installed with 3 programmable control zones: Alarm, Slow Down and Stop. Class 1 laser meets OSHA 6 environmental regulations (won't hurt your eyes). 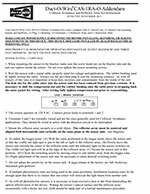 Dynamically protected as laser faults if target is lost. 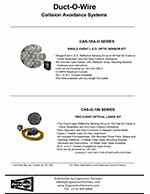 Laser can acquire a target under any lighting conditions. Military spec, shock mounted circuit board. LG2-H-4 Designed for indoor service on AC or DC powered cranes (85-264 VAC or 120-370 VDC). The contacts are 10 amps, 270VAC/27VDC, and the range is 8in-150ft. The system provides 3 contacts for controlled slowdown. It also provides a fault relay to indicate problems or to cut out power to the crane. The system includes: laser, bracket, enclosed Laser Support Unit, reflector, and a 10m cable (Longer cables are available). LG2-L-4 Designed for indoor service DC powered cranes (9-36 VDC). The contacts are 10 amps, 270VAC/27VDC, and the range is 8in-150ft. The system provides 3 contacts for controlled slowdown. It also provides a fault relay to indicate problems or to cut out power to the crane. The system includes: laser, bracket, enclosed Laser Support Unit, reflector, and a 10m cable (Longer cables are available). LG2-H-4X Designed for corrosive and harsh environment service on AC or DC powered cranes (85-264 VAC or 120-370 VDC). The contacts are 10 amps, 270VAC/27VDC, and the range is 8in-150ft. The system provides 3 contacts for controlled slowdown. It also provides a fault relay to indicate problems or to cut out power to the crane. Sensor and control are supplied in a NEMA 4X enclosure. 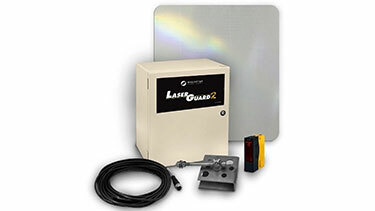 The system includes: laser, bracket, Laser Support Unit, reflector, and a 0.5m cable. LG2-L-4X Designed for corrosive and harsh environment service on DC powered cranes (9-36 VDC). The contacts are 10 amps, 270VAC/27VDC, and the range is 8in-150ft. The system provides 3 contacts for controlled slowdown. It also provides a fault relay to indicate problems or to cut out power to the crane. Sensor and control are supplied in a NEMA 4X enclosure. 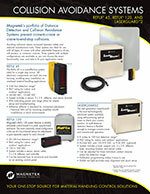 The system includes: laser, bracket, Laser Support Unit, reflector, and a 0.5m cable. Ergonomic Partners is a distributor for Magnetek and Duct-O-Wire Crane Anti-Collision devices; serving clients from coast to coast, Canada, Mexico and especially focused in the states of Missouri, Illinois, Indiana, Kansas, Arkansas, Mississippi, Nebraska, Tennessee, Kentucky, Iowa, and Oklahoma.